Wasabi Web is looking for a Wordpress Developer! Wasabi Web is looking for a Wordpress Developer! Do you have a love for web development? Are you energetic and always looking for new creative solutions? Are you also a team player who can transmit your technical skills to colleagues and customers? If so, take the opportunity to improve and exchange skills together with other talented developers, communicators and UI / UX designers at the award winning agency Wasabi Web! The Wasabi Web office is located in the old-style central bank’s premises in the heart of Uppsala. Do you want to become a part of a wonderful company with a focus on teamwork and quality? Check out the movie below and get inspired! As web developer at Wasabi Web, you will form part of a flat organisation consisting of a great team of web developers, copywriters and designers. You will work closely with the whole team and together, you will work to increase user-friendliness on our websites. You will play an important part in the development of new modules in our own product WW Platform, which is based on WordPress. The position suits you if you want to grow as a web developer and, together with the Wasabi Web team, strive toward common goals. Freedom with responsibility and flexible work hours are applied. Lunch & Learn – every three months, we have guest lecturers come to the office for inspiration. As a person, you are a team player who is always willing to help the team and doesn’t hesitate to lend a hand whenever assistance is needed. In addition, you enjoy having a supporting position, in which you contribute to increase customer satisfaction. You like to work in a structured manner and always make sure you finish the projects you’ve started. This recruitment process is handled by Wasabi Web. 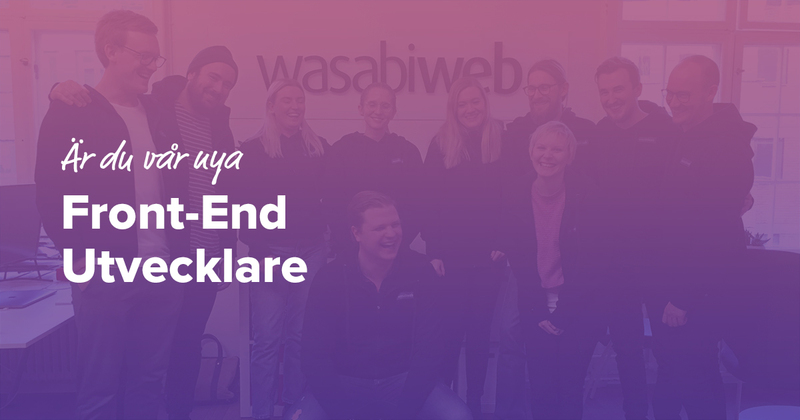 Send your resume to: nils@wasabiweb.se. Central in Uppsala, also perfect commuting distance for those who live in Enköping, Västerås, Gävle, Stockholm, Knivsta or Märsta. When you submit your application to Wasabi Web, you agree to Wasabi Web processing your personal data in accordance to GDPR. Wasabi Web is an award-winning web agency in Uppsala, focusing on web production that increases corporate revenue. We also works with digital marketing, as to drive the traffic to web pages. Wasabi Web has gained the trust of over 300 brands such as Apollo, Taco Bar, Grammis, Vattenfall and Tom Hope.